Regional Clubs are the heart of the APHA, and support of these grassroots clubs is vital to the growth of the Paint Horse industry. APHA’s qualifying is strictly participation-based, and on the horse only. 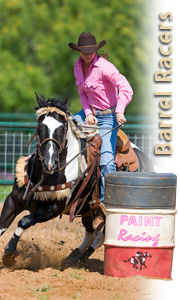 All horses (Regular Registry and Solid Paint-Bred) must qualify to participate at the World Championship Paint Horse Shows. (See #5 for exceptions.) In order to qualify to compete at each World Show, all horses must compete at four (4) different APHA-approved show events, with a minimum of eight (8) judges total during the qualifying period. Horses may be shown in any state to qualify, regardless of residence, to qualify –participation is the key. a. No single show activity can create more than two (2) show events at any given time. • A two-day, two-judge show held Saturday and Sunday counts as one show event. • Two back-to-back two-judge shows count as two events total. • A four-judge POR counts as one show event. • Two back-to-back four-judge PORs count as two show events. • A 4-judge POR back-to-back with a 4-judge POR back-to-back with a 2-judge special event counts as a maximum of two show events. Special events held with APHA dual-approval (i.e. an NRHA reining with APHA dual-approval or NSBA classes with APHA dual-approval, etc.) count toward the qualification requirements. Paint Alternative Competition-approved events do not count toward qualification. The World Shows do not count toward qualification. Note: All owners must be APHA members at the time of the show in order for that show to count towards the show requirement for qualification. of the World Show year. Horses are not required to qualify in specific events in any division. Any qualified horse may be shown in any class at the World Show in any division in which they are eligible. Horses will show in their appropriate age division at the World Shows, regardless of the qualifying division. Exhibitors are not required to qualify. Any exhibitor may show any qualified horse in any class at the World Show in any division. Amateur and Youth eligibility and ownership rules apply. Horses being shown only in the following classes are not required to qualify due to time restraints and age of horse. Note: Additional exceptions will be determined by zone, based on classes not offered during the qualifying year in the owner’s zone. Exemption will be granted to horses whose owners reside in that zone only in the classes that were not held. If a horse is qualified by the exemption, the horse must be entered in that class to be eligible to compete at the World Show. Example: roping, cutting, over fences, etc. in certain areas. Specialty classes (including Youth Leadline, Parents Western Pleasure, Challenge, Sweepstakes, Slots and futurity classes) do not require horse qualification to enter; although if regular classes are also to be entered, then the horse must qualify. At no time will the number of points or lack thereof be considered for qualification. Participation at APHA-approved shows is the only basis for qualification. Additional questions about the participation-based World Show qualifying can be directed to the APHA Performance Department at (817) 834-2742, extension 773.